Home / Blog / Is a Chimney Balloon the same as a Chimsoc? “Most emphatically not!” sputtered Chimney Balloon inventor David Woodman indignantly, when I phoned him up to ask him. It seems I had stumbled upon a story of betrayal, subterfuge and rivalry in the little-known world of chimney draught excluders. David Woodman invented the Chimney Balloon back in 1989. He was an engineer and inventor by profession. He and his wife Irene had recently bought a rambling old property as a project, and a key feature was a fireplace in most rooms. One cold and windy evening he found himself unable to concentrate for the wind noise and cold draughts that were being caused by the study fireplace. “Air is lost up the chimney due to a phenomenon called the stack effect” he explained. “If it’s cold outside and warm inside, then the air is actively drawn out of a chimney, it doesn’t passively rise. This pulls all the warm air out of a room and cause cold air to be pulled in to replace it, causing the draughts we notice around doors and windows.” He put his engineer’s mind to work and before long the Chimney Balloon was born. The house project was put on hold as David and Irene developed the idea into a marketable product and grew the Chimney Balloon Co into a thriving business. Back in those days there was no internet, so they had to market the balloon the old-fashioned way: by attending shows, advertising in magazines and mailing customers. The difficult thing about selling chimney draught excluders is that generally people are unaware of how much heat is being lost up the chimney. It’s the cold draughts coming in that are noticed, not the warm air sneaking out. The Woodmans had to tell the story over and over again – and once people learned about how much heat was being lost up the chimney, selling the solution, the Chimney Balloon, was an easy sell. The Woodmans grew their business by selling through fireplace shops and a network of distributors. One distributor in particular took an interest in their business and became one of their principal sellers. Things were going well. Sales were on the increase, the Chimney Balloon was approved as an energy saving product in Australia, and hundreds of thousands were being sold. Then almost overnight, things pivoted into crisis for the Woodmans. The patent on the Chimney Balloon expired (patents expire after 25 years and cannot be renewed) and the Chimsoc suddenly appeared on the scene. And it was being sold by none other than their principal distributor whom they had regarded as a friend and colleague. Unbeknown to them, for more than a year while he had been selling the Chimney Balloon, he had secretly sent a sample of it to China to be reverse engineered and copied. A year before the launch of the Chimsoc, the domain name and trademark were registered. For a full year he continued to work with the Woodmans, all the while plotting to sell his own rival copy when it was ready. Even the size range was copied. However, according to David Woodman, there are a range of differences between the Chimsoc and the Chimney Balloon that on closer inspection reveal the original inflatable to be more effective and safer in a number of key design features. The main difference is the material the products are made out of. The Chimney Balloon is made of a food grade tri-laminate plastic. This is extremely strong (it’s designed to resist being punctured by meat bones!) but if exposed to heat it shrivels to nothing. This is an extremely important safety feature: if a fire is accidentally lit with the balloon in place, it will simply shrivel and fall out. The Chimsoc is made of PVC, which is more resistant to heat, so it will get hotter before bursting. Burnt PVC gives off hydrochloride gas, which on contact with moisture (eg inside lungs) converts to hydrochloric acid. The Chimney Balloon looks extremely simple but there are some well thought through features which went un-noticed in the reverse engineering process. Each size has different grades of rubber bands. These retain just the right amount of tension so that the balloon expands outwards in order to grip the chimney walls. If the tension is too loose the product will simply expand upwards and be ineffective. The Chimsoc has a neat looking internal PVC tube to enable it to expand outwards rather than upwards, but there is no stretch in it so the range of chimney sizes that each size of Chimsoc can fit is more limited than the Chimney Balloon. The tap for closing off the air in the Chimney Balloon has a slightly oval inner section, which ensures a tighter fit when it is closed. It was developed for the homebrew industry so it needs to be entirely leak-proof. Without this subtle design feature, the valve can be the first point of weakness in an inflatable chimney stopper. The valve through which the air flows has a feature which maximises the airflow in to inflate it and airflow out to deflate and remove it. The copy doesn’t incorporate the subtleties of this design making air flow constricted and consequently harder to inflate and deflate. The irony is, that by getting the Chimsoc reverse engineered and made in China, the consequence was that the technology more openly available. The boom in sales in Australia made it an attractive proposition so a cluster of copies of the copy came along. These were made by reverse engineering the reverse engineered product, so all subtleties of design and functional elements have been lost in the process. Products are being marketed as universal fitting but although the name balloon implies a stretchy material, the plastic in the balloons, especially the PVC ones, has no stretch to it at all so they are actually restricted to a very limited range of chimneys. The other copies at least had the decency, if you can call it that, to give their inflatable chimney draught excluders a different name so that it would be distinguishable to the discerning customer. B & Q have recently brought out a chimney draught excluder called – wait for it – yes you’ve guessed it! – Chimney Balloon. Patent attorneys are expensive creatures and B & Q has deeper pockets than the micro-business Chimney Balloon Co. So how do you tell an original Chimney Balloon from the copies? 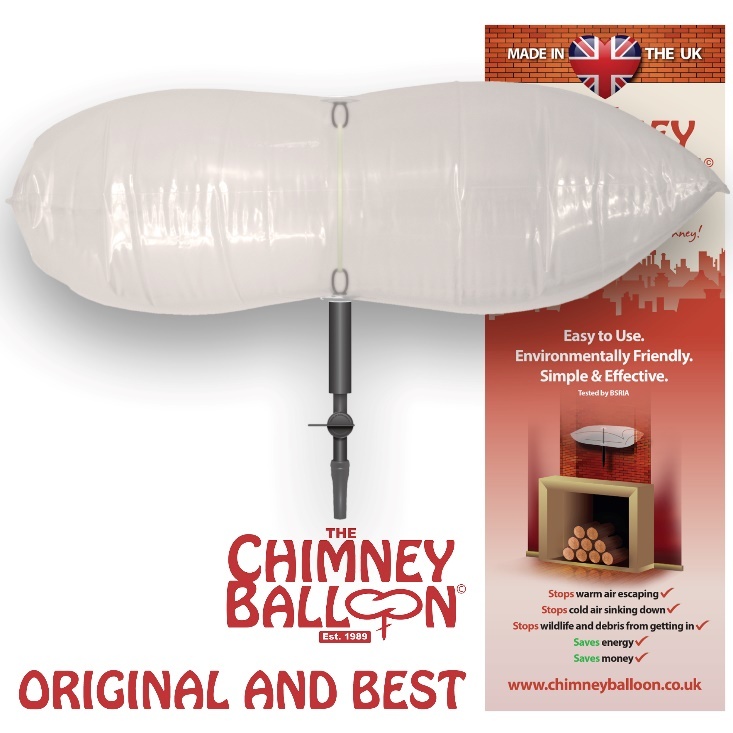 Look out for an “original and best” label, and if in doubt purchase directly from the Chimney Balloon Co themselves. Their products are made in the UK by a company that employs disabled and disadvantaged people who work to an extremely high standard.